Beryl expected to make landfall today, dangerous surf from Florida to South Carolina. 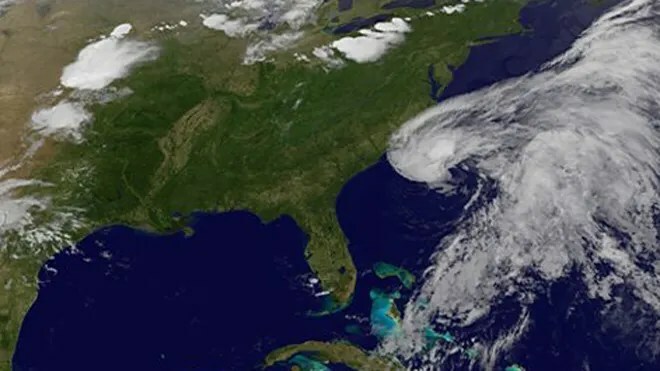 SAVANNAH, Ga. – Subtropical storm Beryl began moving faster toward an expected landfall Sunday night on the Southeast U.S. coast, threatening Memorial Day beachgoers with forecast conditions of dangerous surf and drenching rains from northeast Florida up through a swath of the Carolinas. Tropical storm warnings were in effect for the entire Georgia coastline, as well as parts of Florida and South Carolina, the National Hurricane Center said. Forecasters at the center in Miami said the system of powerful thunderstorms was expected to make landfall sometime Sunday night in the region. Beryl was technically considered a “subtropical storm,” but the system of menacing storms was expected to bring winds and rain to the area regardless of its official classification. At 5 a.m. EDT Sunday, Beryl was centered about 175 miles southeast of Savannah. Forecasters said the system had maximum sustained winds of 50 mph and was moving toward the west-southwest at 10 mph– up from a forward speed of 7 mph reported hours earlier. Tropical storm conditions — meaning maximum sustained winds of 45 mph — were expected to reach the coast late Sunday morning or afternoon and continue through the night. Three to six inches of rain were forecast for a wide area from northern Florida up the coast to the southeastern portion of North Carolina. Some coastal flooding also was in the forecast, as the rain could cause high tides. Dangerous surf conditions, including rip currents, are possible from northeast Florida to North Carolina in the coming hours, forecasters added. Meanwhile, little change in strength was expected before Beryl makes landfall and the storm system was then expected to weaken to a depression Monday once ashore, the center said. The Southeast coast is popular with tourists who visit the beaches and wilderness areas and generally throng to many of its beach communities and resort towns each Memorial Day weekend. On Tybee Island, home to Georgia’s largest public beach east of Savannah, employees at Amy Gaster’s home and condo rental business were making sure arriving guests were aware of the approaching storm during the weekend. Gaster said her 180 rentals were sold out and nobody was canceling plans or asking to check out early. While Georgia hasn’t taken a direct hit from a major hurricane in 114 years, the last time a tropical storm made landfall here was in August 1988. Tropical Storm Chris hit near Savannah but did little damage as it pushed northward into South Carolina. In South Carolina, Beaufort County Emergency Management deputy director David Zeoli said Saturday that word went out to first-responders along the coast near the Georgia line to pay attention to the storm’s progress. « Subtropical storm Beryl causes some evacuations on Florida and Georgia coasts.